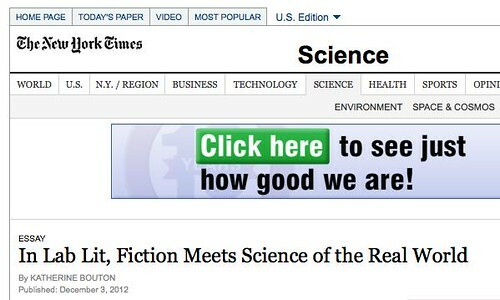 We are tickled that The New York Times used LabLit.com as a resource in a prominent feature about scientists in fiction, and gave it a few name-checks. Respect. And thanks to all those who found us via the piece and have already written in to nominate your favorite books! We’ll take a look and incorporate them in the next List Update if they fit the bill. There is an up and coming novel , written by a new author Norlan Jacobs, that will change your view of Hollow Earth forever! The Source (Part One: The Seed) It’s about a young mans journey to Hollow Earth, what he finds and how it changes his life forever. It’s science fiction supported by science fact (science faction) The book is available at amazon.com or kindle books.com. for more information go to http://www.dreamweaverproductions24.com or http://www.thesourcepartonethe seed.com. It will make a great gift and hours of enjoyable reading. What we need to see for the SF crossover section of the List is very accurate and believable scientist characters who are central. Does this book have that? Fantastic to see the NYT article. Congrats on the well-deserved recognition Jenny. Thanks, Pam! It’s been fantastic to get so many great suggestions for the List.